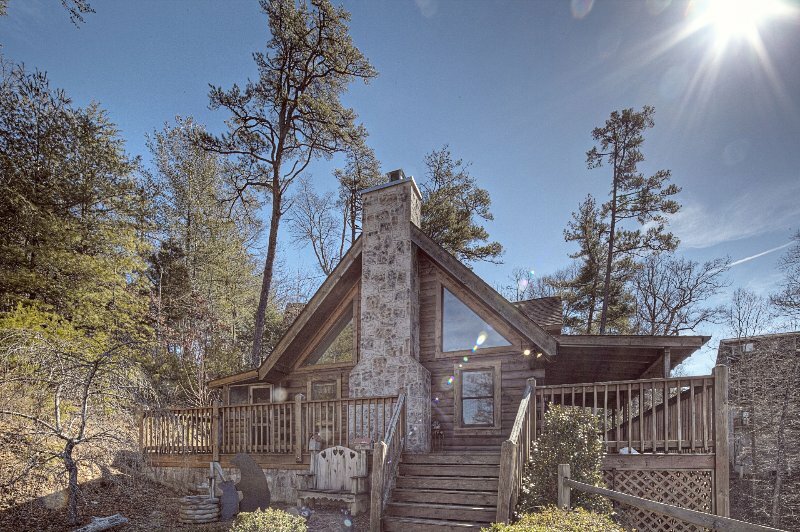 This is a terrific 2 bedroom 2 bathroom fully equipped log cabin. On entry level you'll love the pleasant character of the living room kitchen and dining areas. Each bedroom offers a king-sized bed and full private bathroom. The master bedroom, located upstairs, features an incredibly romantic oversized Jacuzzi surrounded by mirrors, as well as a fireplace. That's right! Built into the wall above the Jacuzzi is a fireplace that enables you to relax with your sweetheart by a glowing fire. If outdoor relaxation is what you are in the mood for, step out onto the deck and sit back in the bubbling hot tub. You are just minutes away from downtown Pigeon Forge, Gatlinburg, and of course, the Great Smoky Mountain National Park.